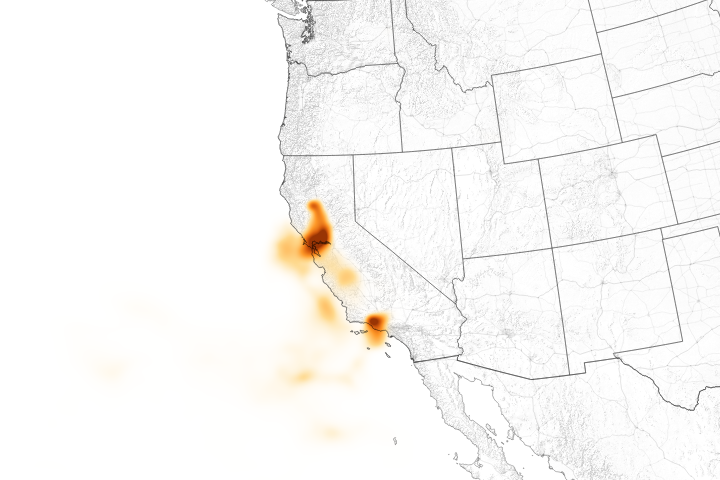 Since it ignited on November 8, 2018, the fatal Woolsey Fire has burned at least 96,000 acres in Southern California. 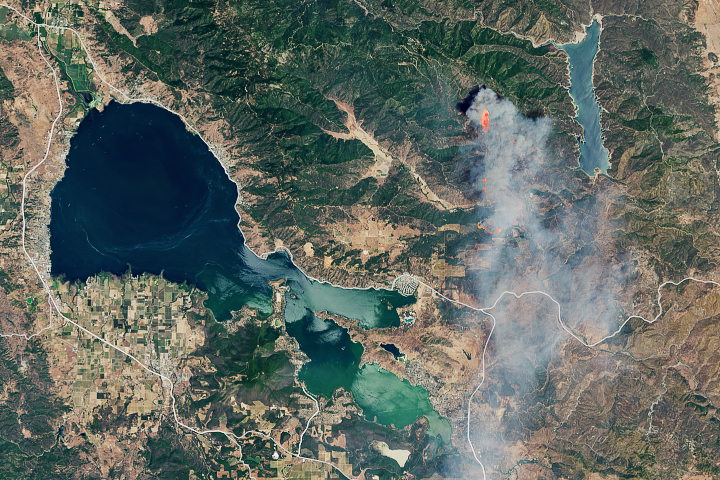 While the fire is still burning, a NASA-funded project is providing extensive satellite information to help agency fire managers understand the active wildfire and plan for recovery. NASA’s Rehabilitation Capability Convergence for Ecosystem Recovery (RECOVER) is an online mapping tool that pulls together data on 26 different variables such as burn severity, land slope, vegetation, and soil type. 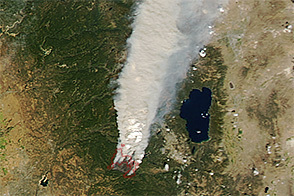 In the past, fire managers might need several days or weeks to assemble and present such a large amount of information. Funded by NASA’s Applied Science Program, RECOVER does so in five minutes, with the help of sophisticated server technologies that gather data from a multitude of sources. The speedy release of data—sometimes while the fire is still occurring—allows fire managers to start rehabilitation plans earlier and implement recovery efforts quickly. 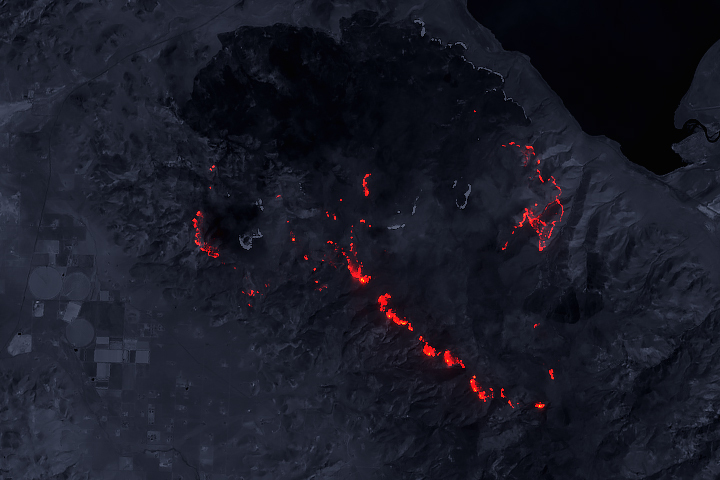 Much of the data for RECOVER comes from the Landsat 8 satellite, NASA’s Shuttle Radar Topography Mission, and the Moderate Resolution Imaging Spectroradiometer (MODIS) instruments on NASA’s Terra and Aqua satellites. Some data layers also come from partner agencies like the U.S. Geological Survey, Bureau of Land Management, and U.S. Forest Service. 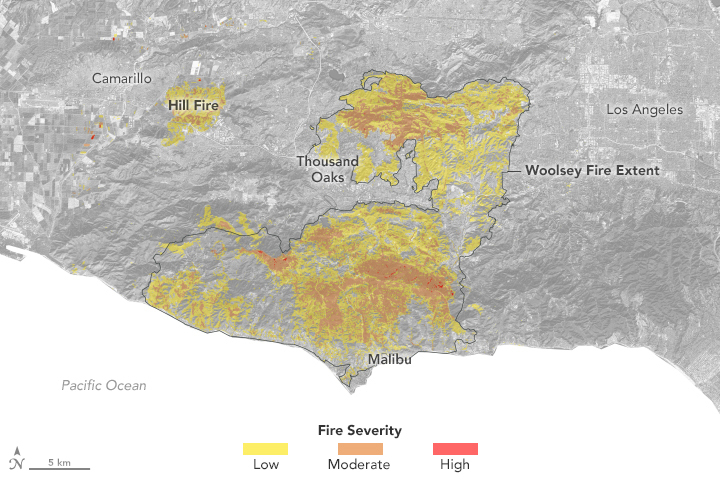 The image above is a preliminary burn severity map for the Woolsey Fire, as posted by RECOVER on November 15, 2018. 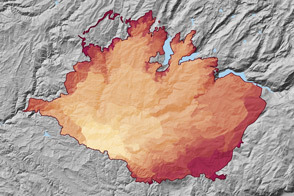 Burn severity maps help determine the amount of ecological change in an area, such as vegetation loss, after a fire. 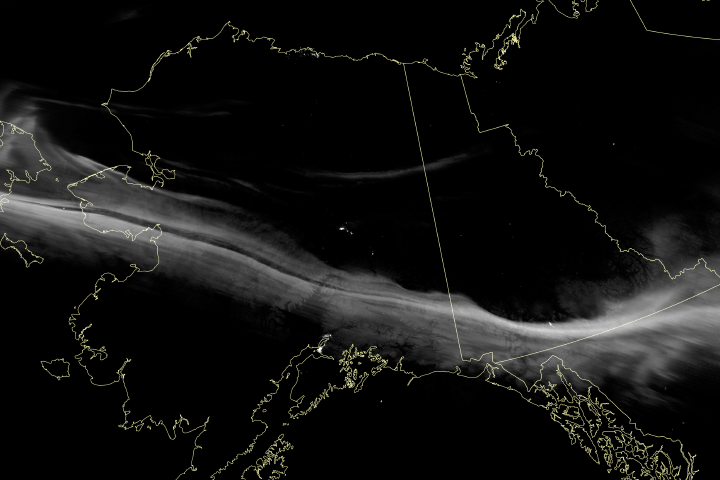 This satellite-derived data layer—called the burned area reflectance classification—was produced by the U.S. Forest Service and available in the RECOVER system. This preliminary burn severity map is expected to change because the fire is still burning. 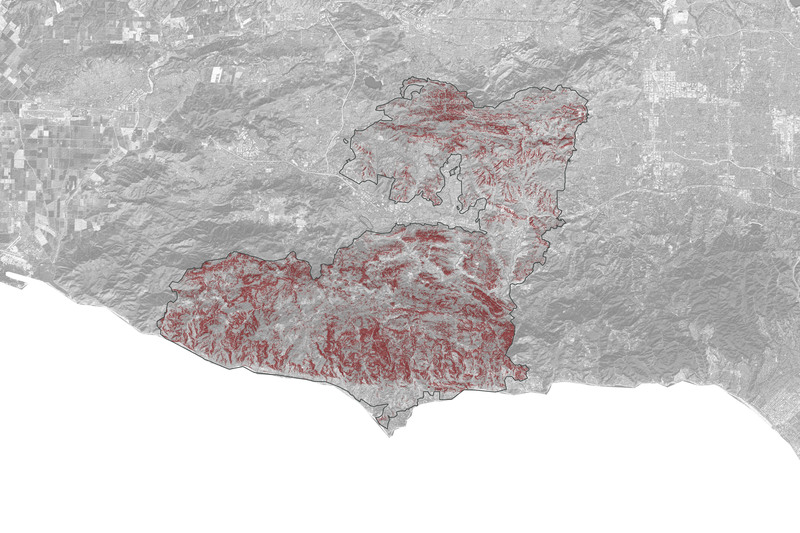 The second image shows topography in the area of the Woolsey Fire, highlighting areas with steep slopes. 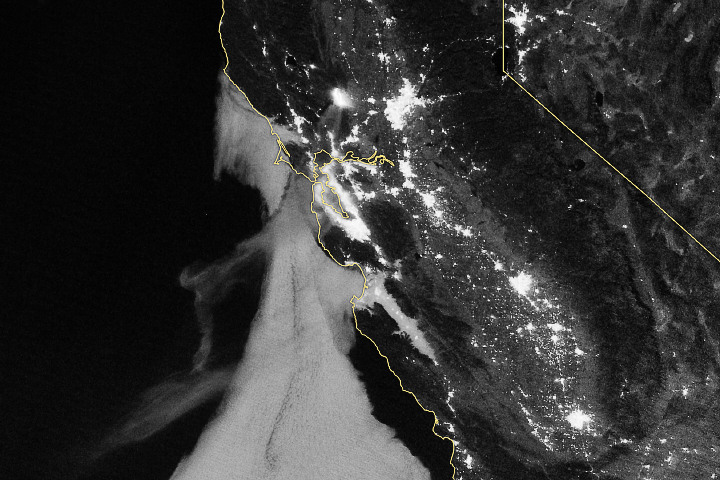 The data comes from NASA’s Shuttle Radar Topography Mission. Slope is an important land feature because fires tend to burn faster as they move uphill and as slopes get steeper. Once a slope’s steepness exceeds 30 percent, firefighting with bulldozers or trucks becomes dangerous and emergency response teams must fight the fires on foot. Started in 2012, RECOVER currently has more than 150 users, including the Bureau of Land Management, the U.S. Forest Service, the National Park Service, the Bureau of Indian Affairs, the Army Corps of Engineers, and several state and local agencies. As of November 15, the Woolsey Fire had burned at least 88 percent of the Santa Monica Mountains National Recreation Area, more than any other fire in the history of that park. Weber has been sharing RECOVER information directly with colleagues at the National Park Service, who are looking ahead to recovery. NASA Earth Observatory maps by Lauren Dauphin using topographic data from the Shuttle Radar Topography Mission (SRTM) and NASA's Rehabilitation Capability Convergence for Ecosystem Recovery. Story by Kasha Patel. A NASA project is providing maps of satellite data to emergency response teams during the Woolsey Fire. California Department of Forestry and Fire Protection Incidient Information. Accessed November 16, 2018. 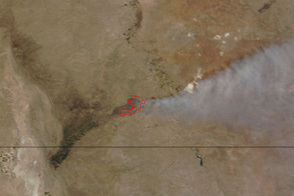 Idaho State University NASA RECOVER Accessed November 16, 2018. 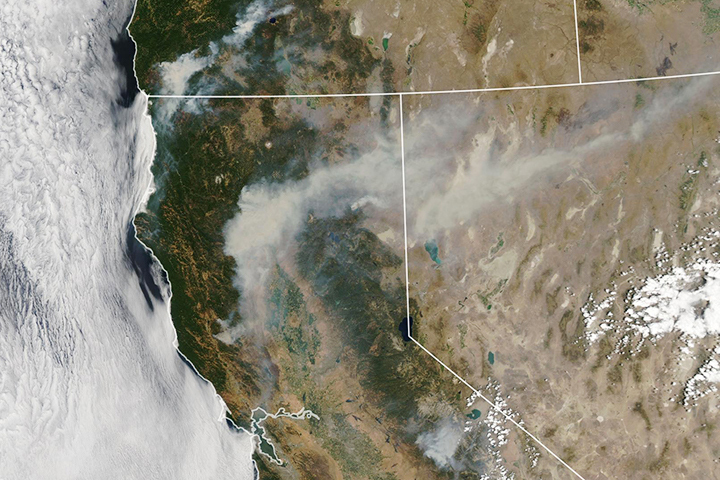 National Park Service (2018, November 15) 2018 Woolsey Fire. Accessed November 16, 2018. 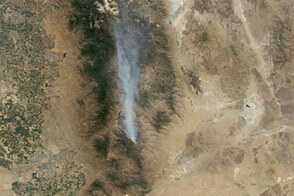 NASA Spinoff Software Helps Restore Fire-Ravaged Habitats. Accessed November 16, 2018.